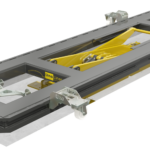 The UnoLiner CRS4000-RO chassis straightening bench with its 3-ton lifting capacity is a prime example of high-quality collision repair equipment. 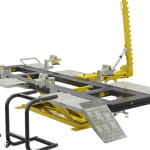 Its ergonomic bench height guarantees ease-of-use during chassis straightening, sanding, car body panel repair, bumper replacement, and regular maintenance. 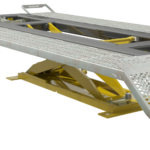 RO stands for roll over, which means the drive-on ramps have been omitted to save costs and space—especially useful when the bench is installed in-ground. Because this bench has a height of only 14 cm in its lowest position when not placed in-ground, it is easy to position a car on it. 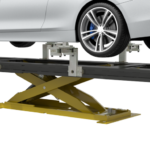 The optional R10 Drive-On Ramp allows cars with little ground clearance, such as exotic sportscars, to be placed on the bench. 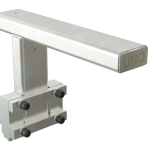 This frame machine is compatible with all UnoLiner accessories. 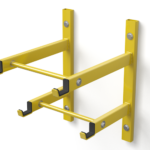 The CRS4000-RO set includes an F40 Bench Frame with an L30 Scissor Lift, 4x C10 Quick-Lock Universal Chassis Clamps. 4x B10 Bench Adapters, 4x H10 Wheel Stand, 1x P10 Draw Aligner Pulling Tower, and 1x F1030 Bench Height Set.